EasyCare Endurance Ride in the Durango Colorado Area? I'm contemplating putting on an endurance event in the Durango, Colorado area in the future. The single track trails in the area are some of the best in the world and I believe people would return home in awe. The idea would be to have an EasyCare sponsored event. An opportunity for EasyCare to support the sport of endurance. Free or very minimal entry fees, free meals, seasoned vets, great base camp, awesome awards, and incredible trails. I'll look into bringing it together and possibly including some of the other manufacturers who support AERC. I took my mountain bike out yesterday and did a short portion of the Colorado Trail that runs 500 miles from Durango to Denver. Take a look at the short video I took from my mountain bike. Imagine riding 50 miles of similar trails on your horse. 2008 Tevis Cup Canceled due to smoke and fires. See website for more details. Team Easyboot member Todd Hezeau and his mare rode the 75 miler Freeze R Burn Ride using Easyboot Bares this past weekend. Team Easyboot members have jumped in and gotten involved in everything from rides to shows. 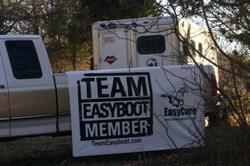 Todd even made his own Team Easyboot banner to display at the ride! Click here to see what Todd has to say about his recent ride. There is a great interview featuring Pete Ramey in December's issue of Horse and Rider Magazine. The article topic: The Benefits of Barefoot. Jennifer Forsberg Meyer chats with Pete about the benefits of a shoeless foot. Pete says, "it's not about the hoof alone; it's about improved overall health." He also says, "Since switching my focus to barefoot trimming and boot/pad use for dealing with pathological hooves, I've seen hundreds of foundered and 'navicluar type' horses return to health." We all want to make sure our horses have the best hooves they can possibly have. Pete also discusses one of our favorite topics... hoof boots. He says that the newer designs are much easier to use than older models. 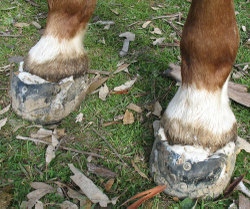 Hoof boots give you the ability to vary your horse's tread pattern as conditions change. 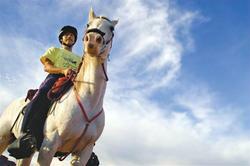 He also talks about how booted horses continue to take over the endurance world. It's great to read articles from people in the hoof care industry who are consistently improving the quality of life for our four legged friends. Want to read more on this article? Pick a copy up for yourself! Happy reading!!! The Tom Quilty Gold Cup endurance ride was Saturday September 29th at Tumblegum Farm, WA, Australia. Christoph Schork riding horse Arovo Mini Harvest and Anton Reid riding horse Endurowest Kumari were the winners, in a tie for first place! Congratulations to Christoph and Anton!!!! This is Australia's version to the Tevis Cup and has been running since 1966. It is a 160km ride and had a 41.3% completion rate. The event was still able to go on with the equine flu still affecting Australia, although the number of entries were down this year. Carol Layton Easy Foams Bares on! Hello from Australia. 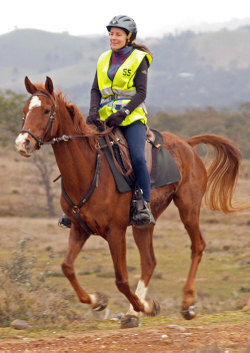 I had a great ride over the weekend on Omani Mr Sqiggle trialling the Easy Foam with four Easyboot Bares at an endurance ride held at Windeyer, near Mudgee in NSW. I needed to trial the foam for the Shahzada marathon in the last week of August and now I know this is the answer for us. I am totally delighted with the result. No need to be concerned about the possibility of rubbing from the gaiters. I mean I have been able to do 160km rides and 400km marathons with boots and not had any rubbing from gaiters, but this foam means it doesn't need to be on my mind. I don't have to fiddle with Sportstape or vetwrap. It was easy to mix the glue together and put the boots on, we just removed the gaiters. 53rd Annual Tevis Cup is here! The 53rd Annual Tevis Cup is this weekend! Tevis is the oldest modern day endurance ride and has been the inspiration and model for the most challenging endurance rides worldwide. Participants will ride 100 miles in a single day! This year there are over 185 participants and over 700 volunteers. You will be able to keep a close eye on the action! This years photo webcast is sponsored by EasyCare and is interactive. You will be able to check in and see where the riders and horses are, look at vet checks, and view ride photos and even video! So check it out on Saturday July 28, 2007! Karen Chaton is helping with the photo portion of the webcast. So stop by and say hello! She'd love to see you! 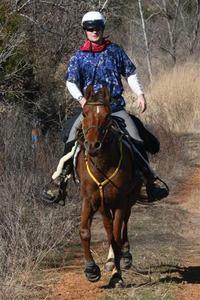 The 53rd annual Tevis Cup 100 mile Endurance ride is this month. To celebrate EasyCare will be having a new special for website orders every week during the month of July. This week (July 15-21) we have a Two for One special - Buy a pair of EasyCare Comfort Pads and get the 2nd pair for free. 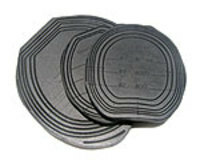 Offer limited to 6 and 12 mm black Comfort Pads (no Comfort Pad System pads). Offer limited to ten pairs per person and are for website orders only Be sure to check our home page each week to see what great special is available. 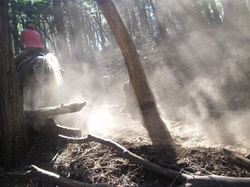 Here's a cool picture taken at Devil's Thumb during last years Tevis Cup. Picture taken by Tinker Hart.